If you’ve flown with Emirates before, chances are you’ve heard an announcement on board regarding the collection of donations for the Emirates Airline Foundation that helps children in need around the world. I recently became involved with one of their projects that supports special needs children in Dubai, UAE as a Special Needs Educational Assistant with Safe Center for Autism and Asperger’s Syndrome. Safe Center provides a nurturing environment for children struggling with behavioural and developmental difficulties such as Autistic Spectrum Disorders, Aphasia, Apraxia, Cerebral Palsy, Fragile X Syndrome, Speech/Language Delay, Sensory Deficits, and Downs Syndrome. In cooperation with one of the UK’s largest specialist education service providers, the facility provides special educational programs that include speech, language and behavioural therapies. Our mission is to inspire and empower these children by providing personalized education in a nurturing learning environment; tailored to equipping them with the skills necessary to attain the highest level of independence possible so that they may achieve greater integration into the community. My role involves creating a stimulating environment for students; assisting them with their personal development while tending to their physical needs as well as their social and emotional welfare. Under the patronage of His Highness Sheikh Ahmed bin Saeed Al Maktoum, Chairman & Chief Executive, Emirates Airline & Group, the Emirates Airline Foundation is a non-profit charitable organization aimed at improving the quality of life for children, regardless of geographical, political, or religious boundaries, to help them maintain or improve their human dignity. The foundation has helped the Safe Center to sponsor teachers and have also contributed a school bus for the students. 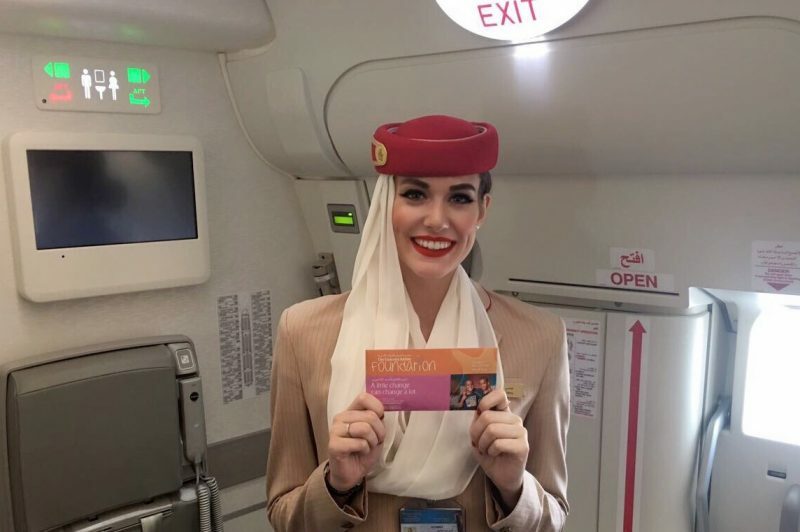 Cabin Crew collect donations for the Emirates Airline Foundation on every Emirates flight. You can find the donation envelope in the seat pocket in front of your seat (similar to the one pictured above). I ask that you please consider making a contribution the next time you fly with us. It’s truly amazing to see how such a small action can change so many lives. I’ve seen it firsthand, and am happy to be a part of this positive initiative. You can also contribute online and use your skywards miles too. I really like your blog and I’m always looking forward to see the next destinations. However this time I can’t hide my disappointment. This post looks it was paid or you were forced to do it. It doesn’t seem real. The content looks completely “marketish”. I do know that I’m not forced to read it and I can just stop following you but this time I felt I had to say something. I apologize in advance if I upset you with my comment. My apologies if it comes across that way. I’d never accept any form of compensation in exchange for writing a post and I can assure you that it’s real- not forced at all. I’ve recently become more involved with the EK foundation and wanted to share with my readers what it is all about, as well as how our role as Cabin Crew ties into it. People want to know about my job, and collecting donations on board and talking about the EK foundation with customers is part of it. I’ve also been receiving a lot of questions lately about what I do in my spare time, and volunteering with the Safe Center is one of the things that I get up to. It’s something close to my heart and I wanted to let people know about it. As far as my post sounding marketish, I tried to word it in a more professional manner given the nature of the subject. You’re entitled to your opinion, but I truly have a passion for helping others. Working with the EK foundation and Safe Center is a way for me to give back to the community, and using my online platform to talk about them helps to raise awareness and support.